Robert Bloomfield was an English poet who grew up in a rural, working class environment during the late 18th century. He loved to write poetry and his efforts have been compared favourably with the likes of other pastoral poets such as George Crabbe and John Clare. He had a period of relative prosperity due to his work becoming known worldwide before finally sinking into depression and, ultimately, poverty. He was born on the 3rd December 1766 in the small village of Honington in Suffolk. It was a poor upbringing and he lost his father to smallpox while still an infant. Robert was fortunate that his mother was the local school mistress and she ensured that he received as good an education as she could give him. He had another lucky break when he was apprenticed to work on land owned by the Duke of Grafton, a man who was one of only a few Dukes who achieved the position of Prime Minister. Bloomfield’s poetry came to His Grace’s attention and the Duke eventually became his patron. Bloomfield was physically weak and unsuited to heavy farm work so he joined his brother George in London who was a shoemaker. He was probably the best educated amongst the workers there and he was usually asked to read aloud the newspapers for their benefit. He took a particular interest in the poetry section of The London Magazine and was inspired to get his first poem published in 1786, a piece called The Village Girl. 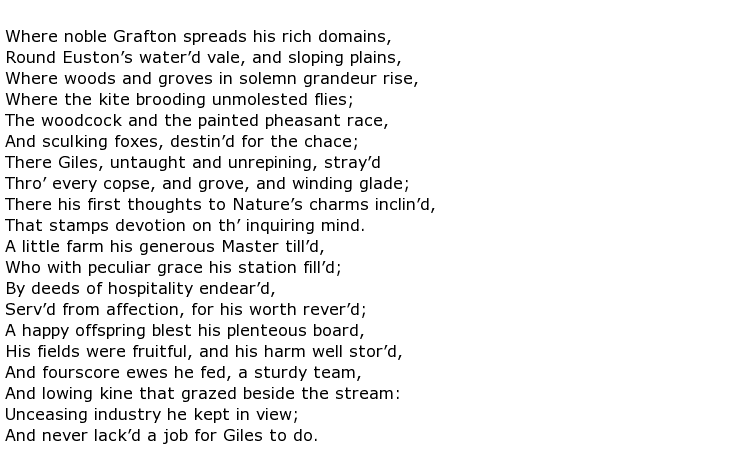 This poem brought him to the attention of the elite in the literary and artistic circles of London. The painter John Constable, who also originated from Suffolk, used Bloomfield’s words to inspire some of his paintings. He was still not financially secure though but it was a great help to him when the Duke of Grafton granted him an annuity of £15 and also set him up in employment in two London locations. He could not settle to the work of a clerk though and wrote more poetry including the collection Rural Tales, published in 1802. Life steadily went downhill during the early years of the 19th century. First his publishers went bankrupt and he had to move back to Suffolk. One of his daughters died and then his wife went insane. Struggling financially by now he tried his hand at bookselling and harp making but neither of these ventures were profitable. His eyesight was failing and his mind becoming more and more troubled during the final years of his life. From being a much loved poet with worldwide exposure of his work he gradually declined into a life of poverty. Following his death most of his belongings, including books and manuscripts, had to be auctioned just to pay off his debts and funeral expenses. Robert Bloomfield died on the 19th August 1823 aged 56.